Texts of most of the authors read in this course can be viewed via the resources of the Perseus Project. In the assignment list below, if an author’s name is highlighted, just click on it to go directly to the Greek. When viewing the Greek, you can click on a word and obtain from Perseus a morphological analysis. You can also go to the Liddell and Scott entry for that word. For most authors to be read, excerpts from ancient criticsare available, in translation. Also available is an essay on Loose Style and Periodic Style by Hardy Hansen with analyses of passages from most of the authors read in this course. 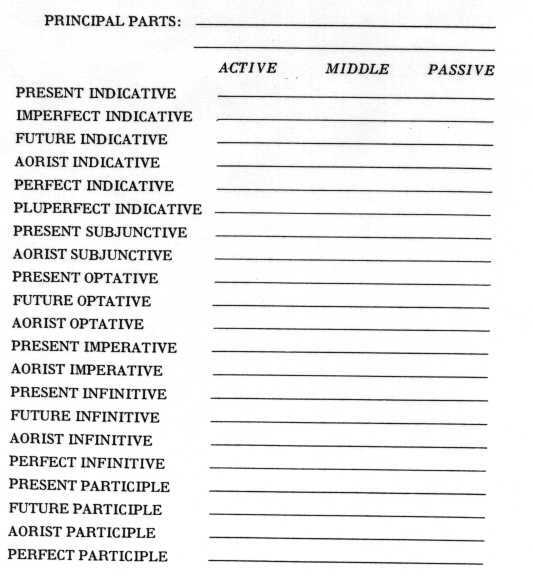 A Style Scoresheet lists notable stylistic features of each author read in the course. There is a series of Introductory Sketches for each author read in Greek 701. A General Bibliography is also available, with links to other Classics sites on the World Wide Web. Woodhouse’s English-Greek dictionary is available online at http://www.lib.uchicago.edu/efts/Woodhouse/. Click here to connect. If you have comments or questions, please e-mail me at hhansen@pipeline.com. In the essay on Greek Sentence Structure: Loose and Periodic Style read the first six sections (through Hekataios) plus the sections on Lysias. For a stylistic analysis of part of the assigned passage (from the essay on style) click here. 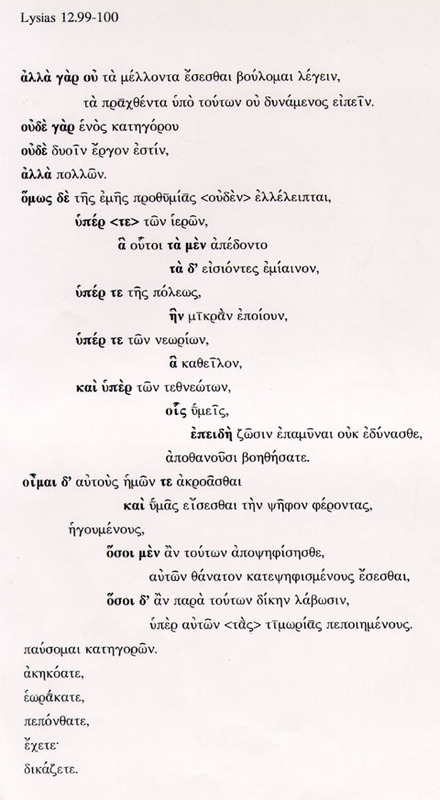 For an appraisal of Lysias’ style by Dionysios of Halikarnassos click here. Click here for the Style Scoresheet. For written assignment #1, click here. Click here for a sample synopsis sheet. For written assignment #2, click here. 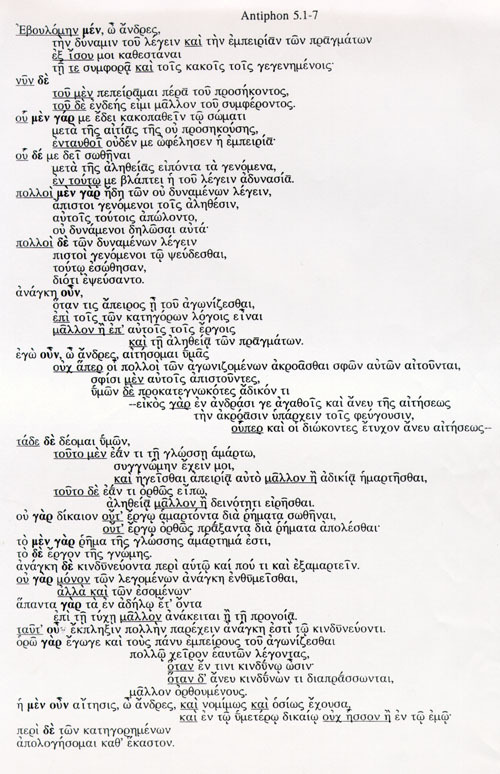 For a graphic of Lysias 12.99-100 laid out in kola and kommata, click here. For written assignment #3, click here. This assignment focuses on correlatives. For a series of “beginning Greek” drills to review correlatives, along with an answer key, click here. For a stylistic analysis of part of this passage, click here. For written assignment #4, click here. This assignment involves conditional sentences in indirect statement. For a chart of the rules click here. the Constitution of the Athenians, 1-9 (not assigned). For ancient comments on Gorgias click here. For written assignment #5, click here. For Thucydides’ appraisal of Antiphon, click here. For a graphic of this selection, laid out in kola, click here. For written assignment #6, click here. For a stylistic analysis of an Isokratean period, click here. For ancient comments on Isokrates’ style, click here. For written assignment #7, click here. For written assignment #8, click here. For ancient comments (and a modern one) on Thucydides’ style, click here. For written assignment #9, click here. For written assignment #10, click here. For an ancient comment on Plato’s style, click here. For an analysis of a “philosophical period” of Plato from the Republic click here. For an analysis of a passage in “pseudo-naive” style from the Protagoras click here. For written assignment #11, click here. For written assignment #12, click here. For ancient comments on the style of Demosthenes, click here. For written assignment #13 click here.